Indian men and women's teams settled for an identical 2-2 draw with Italy and Kazakhstan, respectively in the third round. The Indian men and women's teams settled for an identical 2-2 draw with Italy and Kazakhstan, respectively in the third round of the 41st Chess Olympiad now in progress here. SP Sethuraman was the lone winner for India defeating Alberto David on the second board while Parimarjan Negi went down to world number three Fabiano Caruana. On the other two boards, Krishnan Sasikiran tried hard but could not beat the solid defences of Daniele Vocaturo while B Adhiban drew a game of fluctuating fortunes against Sabino Brunello on the fourth board. The Indian eves were on the brink of defeat but Padmini Rout salvaged a point at the expense of Kazakh's Madina Davletbayeva. This was after Eesha Karavade went down to Zhansaya Abdumalik on the third board. The top two Indian girls, D Harika and Tania Sachdev played out draws with Guliskhan Nakhbayeva and Dinara Saduakassova respectively. 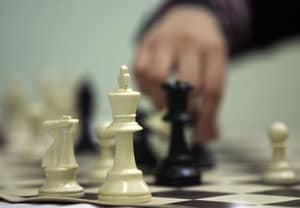 With eight rounds still to come in the biggest chess event with participation on 171 countries, France, Netherlands, Serbia, Russia, China, Azerbaijan, Israel, Czech Republic, Bulgaria, Uzbekistan and Romania are the only 11 teams sharing the lead with a perfect score of six points from three matches thus far. The Indian men share the 12th spot now with 19 other countries. In the women's section, as many as 12 countries share the lead on six points. They are Iran, Slovakia, China, Azerbaijan, Indonesia, Armenia, Germany, Russia, Netherlands, Georgia, Hungary and Cuba. Indian women are in joint 13th spot here. Sethuraman was the star for India on a rather tough day. The Sicilian defense by David Alberto led to some wild complexities in the middle game when the Italian sacrificed a piece for counter play. Sethuraman, however, retained his cool and used his extra material to give the team an early lead. Parimarjan Negi employed the Berlin defense and had to settle for a slightly worse endgame against Caruana. While he had chances to hold on, it was always a difficult grind to go through as Caruana enjoyed a no-risk position wherein he continued relentlessly to level scores. In a battle of heavyweights the Dutch team defeated United States while in the biggest upset of the open section, three times champion Armenia lost to France by 1.5-2.5 margin. At the top, the Russians continued their march defeating Macedonia 4-0. The next round is tough for Indian men as they meet Cuba while in the Indian women are pitted against Serbian ladies. Women: USA (4) lost to China (6) 1-3; Norway (4) lost to Hungary (6) 1-3; Russia (6) beat France (4) 2.5-1.5; Armenia (6) beat Vietnam (4) 3-1; Bosnia & Herzegovina (4) lost to Iran (6) 0-4; Azerbaijan (6) beat Switzerland (4) 2.5-1.5; Romania (4) lost to Indonesia (6) 1.5-2.5; Germany (6) beat Argentina (4) 3-1; Kazakhstan (5) drew with India (5) 2-2 (Guliskhan Nakhbayeva drew with D. Harika, Dinara Saduakassova drew with Tania Sachdev, Zhansaya Abdumalik bt Eesha Karavade, Madina Davletbayeva lost to Padmini Rout).